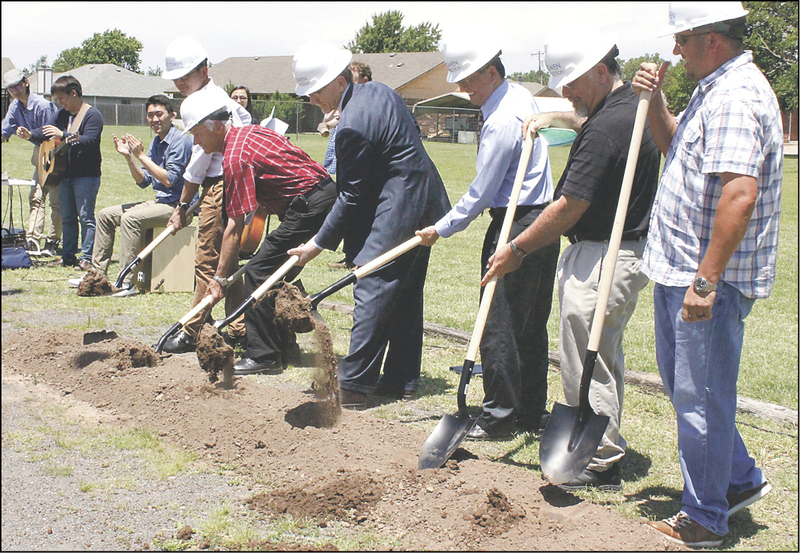 A ‌ram’s horn sounded, balloons sailed skyward, and good guys ‌in white hats turned over a row of earth ‌as Edmond Chinese International United Methodist Church broke ground May 29 for an activity building. In Chinese and English, participants sang "Hosanna" and "To God Be the Glory" at the ground breaking. This growing faith community soon will have 11,000 more square feet for ministry on its property at 321 W. Eighth St. They are nearing the fundraising goal of $1.25 million, according to Senior Pastor Puong Ong Lau. Assistant pastor is John Roper. Edmond Chinese UMC in 2009 acquired the property, with an existing church building of 5,739 square feet — yet even as they moved in, the people were overflowing it. By year’s end 2014, worship attendance was averaging 141, and 13 people had been received on Professions of Faith, according to the Oklahoma Conference 2015 Journal. The new building will include a large multipurpose space, five classrooms, and a commercial kitchen. Crossroads District Superintendent brought the message May 29. "Today you are building on a foundation of effective, fruitful ministry. Fear not! God’s mission shall not be shipwrecked." He reminded, "Our mission is the Word — and filling the building with people engaged in discipleship." Pastor Roper said, "May we be salt and light in this community." The Oklahoma Conference "New People New Places" initiative supports this project. Thus so does every church in this Conference, through the NPNP Apportionment. A $100,000 grant was awarded to Edmond Chinese UMC in 2015 and again in 2016 for "International Ministry — Multipurpose Building." From the NPNP grant summary: "Chinese and other international students ... many with no prior experience of Christianity, find a welcome at this young, energetic church. Edmond Chinese International UMC has a well-defined plan for making disciples of Jesus Christ. The church is operating at maximum capacity in its current facility — and bursting at the seams ... Young adults and children of varied nationalities are eagerly welcoming the opportunity to become disciples." 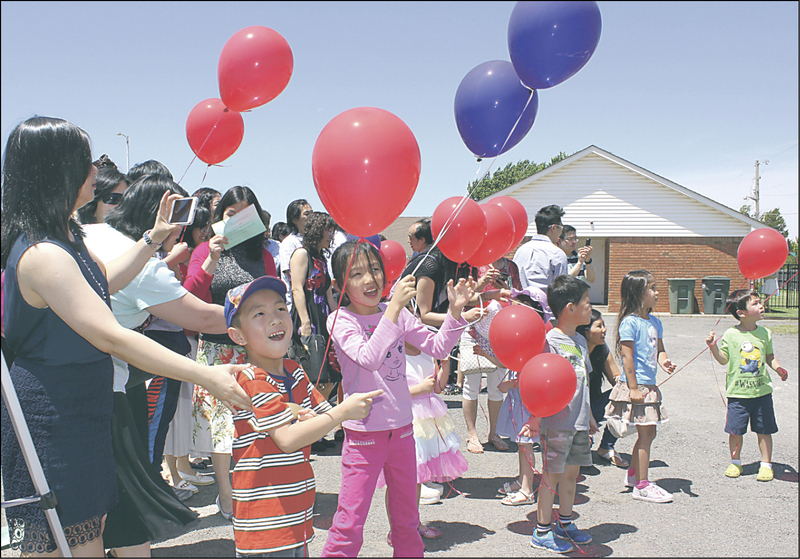 Children track a balloon whisked away by wind May 29 as Edmond Chinese International United Methodist Church marks the start of construction on a multipurpose building. The existing church is in background. 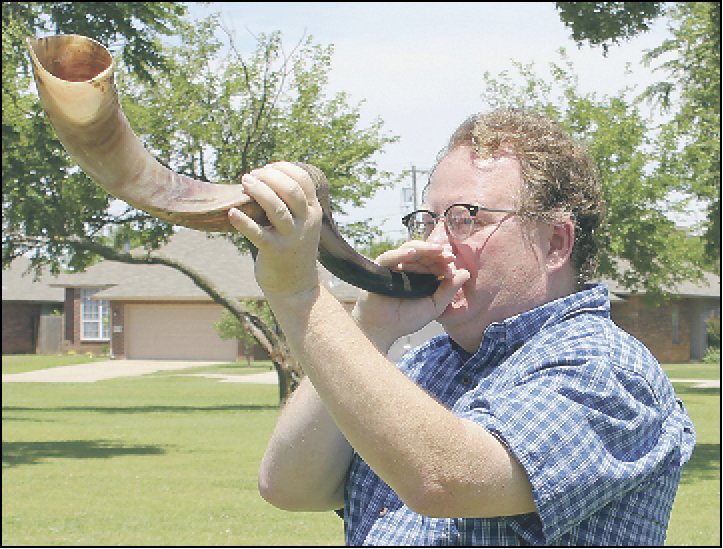 Below, Kent Johnson blows a shofar, the signal for breaking ground.